Lovely compact Astilbe with upright stems of rich lavender-purple plumes from July until late Autumn. Easy in semi or deep shade, in soils that do not dry out. 40cm. high. 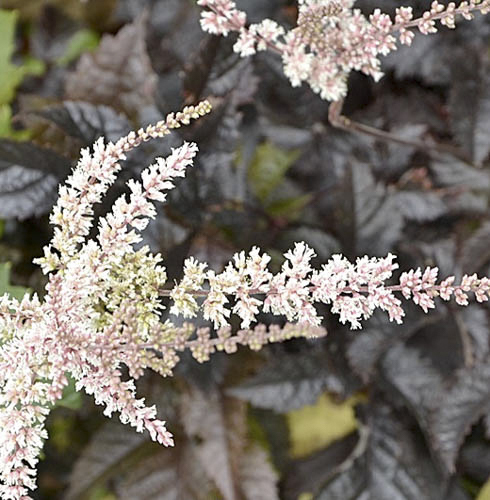 Spectacularly dark, purple-brown foliage is the perfect foil for soft pink flowers in late summer. For semi-shade that does not completely dry out. 60cm. high. Mounds of dark purplish foliage make a good foil for the soft pink flower plumes held on red stems from July to September. Loves dampish soil in semi-shade. 60-90cm. high. This is a particularly beautiful variety. Mounds of lacy, green foliage produce huge white plumes. Thrives in shade and fertile soil. 80-90cm. high. 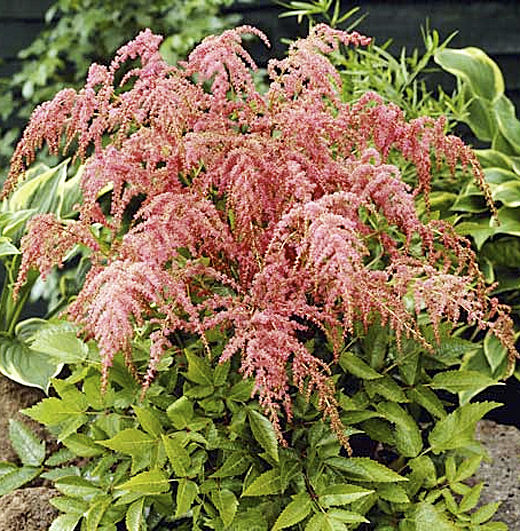 Brilliant deep-pink, stately, arching plumes over bronze tinted foliage are produced mid to late summer. Fantastic shade plant. Not for dry sites. 90-100cm. high. A superb Astrantia with deep wine-red flowers. Very floriferous all summer. Easy in a good soil, in sun or part shade. Divisions from the true form 45cm. high. Re-blooms if cut back. Very floriferous mid-pink, in flower all summer. 60cm. high, for sun or part shade. Numerous white flowers, tipped green, on strong upright stems. In flower all summer, easy in sun or part shade, 80cm. high. Very large dark maroon flowers for a long season. 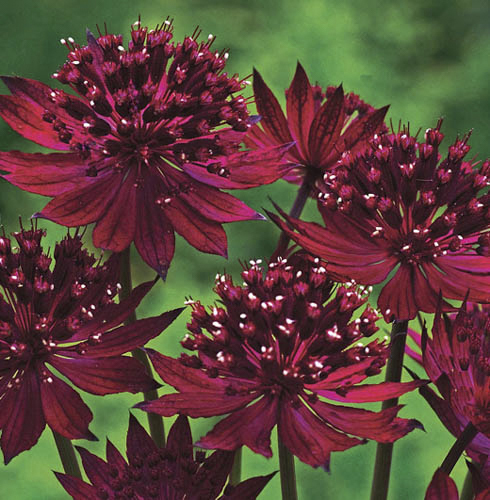 The best dark red Astrantia I have seen. Easy in sun or part shade. 60cm. high.